Before using any solvent based spotter always test a small patch of carpet to ensure the solvent does not bleed any dye from the carpet fibres or cause any other unnecessary damage. 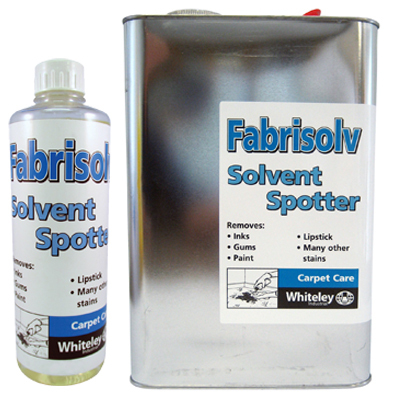 SPOT REMOVAL: Apply Fabrisolv undiluted to the spot. Using a small soft brush or cloth lightly scrub the spot starting from the outside of the spot and working towards the centre. Absorb as much Fabrisolv as possible from the carpet using an absorbent cloth. Then wet extract the remnants using Fabripowr or Fabripowr Plus. LARGE AREAS: Mix 1 part of Fabrisolv to 10 parts water and spray on the carpet at a rate of approximately 4.5 litres per 20 square meters of carpet. The concentration may need to be increased on very heavily soiled carpets. Allow to soak for 10 to 15 minutes. Wet Extract Fabrisolv from the carpet using Fabripowr or Fabripowr Plus. PRETESTING: Some aged and coloured stains may require special treatment therefore it is always advisable to pretest a small area first. Free rinsing. Click here for Fabrisolv Carpet Spotter MSDS.